ABSTRACT: OBJECTIVE: To study the ionic mechanisms of electrophysiologic changes in cell excitability and action potential duration during the acute phase of myocardial ischemia. METHODS: Using an ionic-based theoretical model of the cardiac ventricular cell, the dynamic LRd model, we have simulated the three major component conditions of acute ischemia (elevated [K]o, acidosis and anoxia) at the level of individual ionic currents and ionic concentrations. The conditions were applied individually and in combination to identify ionic mechanisms responsible for reduced excitability at rest potentials, delayed recovery of excitability, and shortened action potential duration. RESULTS: Increased extracellular potassium ([K]o) had the major effect on cell excitability by depolarizing resting membrane potential (Vrest), causing reduction in sodium channel availability. Acidosis caused a [K]o-independent reduction in maximum upstroke velocity, (dVm/dt)max. A transition from sodium-current dominated to calcium-current dominated upstroke occurred, and calcium current alone was able to sustain the upstroke, but only after sodium channels were almost completely (97%) inactivated. Acidic conditions prevented the transition to calcium dominated upstroke by acidic reduction of both sodium and calcium currents. Anoxia, simulated by lowering [ATP]i and activating the APT-dependent potassium current, IK(ATP), was the only process that could decrease action potential duration by more than 50% and reproduce AP shape changes that are observed experimentally. Acidic or anoxic depression of the L-type calcium current could not reproduce the observed action potential shape changes and APD shortening. Delayed recovery of excitability, known as 'post-repolarization refractoriness', was determined by the voltage-dependent kinetics of sodium channel recovery; Vrest depolarization caused by elevated [K]o increased the time constant of (dVm/dt)max recovery from tau = 10.3 ms at [K]o = 4.5 mM to tau = 81.4 ms at [K]o = 12 mM, reflecting major slowing of sodium-channel recovery. Anoxia and acidosis had little affect on tau. CONCLUSIONS: The major conditions of acute ischemia, namely elevated [K]o, acidosis and anoxia, applied at the ionic channel level are sufficient to simulate the major electrical changes associated with ischemia. 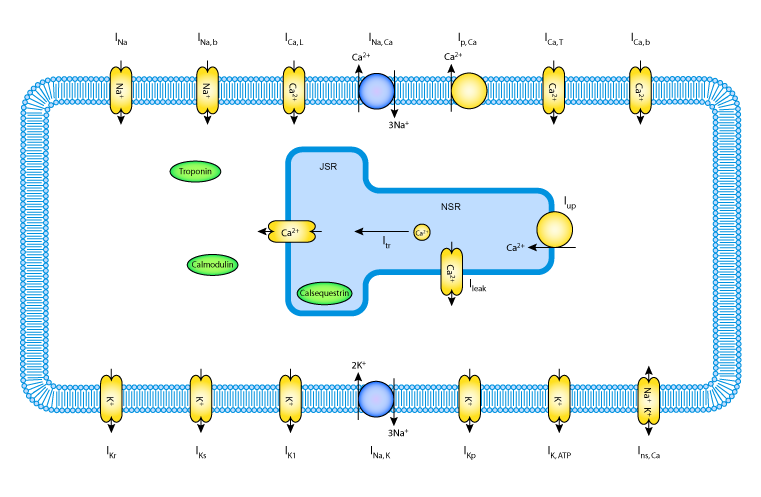 Depression of membrane excitability and delayed recovery of excitability in the single, unloaded cell are caused by elevated [K]o with additional excitability depression by acidosis. Major changes in action potential duration and shape can only be accounted for by anoxia-dependent opening of IK(ATP). A schematic diagram of the Shaw and Rudy 1997 ventricular cell model. Derived from workspace Shaw, Rudy, 1997 at changeset 42dd9c2627a4.